The OptiVantage multi-use injector from Guerbet is now CE-marked. 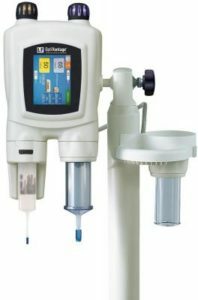 The injector is designed for injecting contrast agents used in X-ray (CT scan) medical examinations and includes the tried-and-tested OptiVantage syringe-based injector, a complete range of associated syringes and disposables (manyFill day set and secufill patient line), services and support systems (OptiProtect). The OptiVantage multi-use system will initially be marketed in EMEA as of January 2019, then progressively in other regions of the world (Asia and Latin America). Existing OptiVantage customers may benefit from an upgrade to easily implement the new multi-use feature. Launched in 2005, the OptiVantage injector is a medical device (Class: IIb, CE0123) intended for use by medical imaging and diagnostic health professionals, for injecting radiopaque contrast media and saline into a patient’s vascular system during CT examinations. The new version is adapted to multi-use markets and is available in pedestal and ceiling-mount versions. The market targeted by OptiVantage multi-use represents over half of all CT procedures worldwide.